Scenes from the utopian north and dystopian south. In the early days of big-budget sci-fi, New York often embodied the worst fears about society, urban living, and technology: Soylent Green (1972), Escape from New York (1981), and others capitalized on New York’s bankrupt and crime-ridden nadir—a genre that Miriam Greenberg refers to as “New York Exploitation.”¹ With the city’s campaign to reposition itself in the 1990s, Los Angeles became the symbol of urban blight, perfectly demonstrated by John Carpenter’s relocation of his Snake Plissken sequel, Escape from L.A. (1996). While dystopian sci-fi also has a home in the United Kingdom (thanks, George Orwell) and has been used for self-reflection by most of the world’s filmmaking cultures, there is something about the frequency with which California and “the future” are used synonymously. In sci-fi movies and the books that serve as their inspiration, the future of the Golden State goes something like this: 10 to 150 years from the present, California has succumbed to natural disaster/economic and governmental collapse/a pandemic, which leaves Southern California a corporate-fascist-military state with gross financial and racial inequality and urban squalor—while Northern California rips up its pavement, learns permaculture, gets spiritual, and models better living through technology and communitarian diversity. This binary began in the 1940s with Earth Abides (1949), a book about a scientist starting over in Berkeley after a global pandemic, while in Aldous Huxley’s Ape and Essence (1948) Los Angeles slouches toward the apocalypse. The movies Planet of the Apes, The Terminator, Escape from L.A., Star Trek, and the books Ecotopia, The Fifth Sacred Thing (soon to be a feature film), and Snowcrash all play variations on this theme. Collapse and division is almost a foregone conclusion at this point—not just a future that might happen, but one many almost expect and therefore accept. 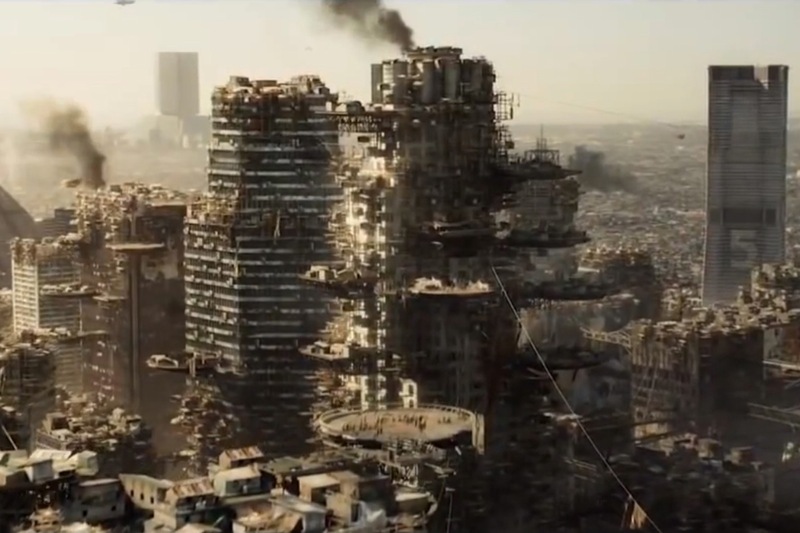 Downtown Los Angeles in 2154 in Elysium, TriStar Pictures, 2013. Davis notes that this was so accepted as a likely trajectory for the city, that it was written into an LA redevelopment plan as a warning of what could happen were the plan not adopted. The plan, LA 2000: A City for the Future, calls this “the Blade Runner scenario: the fusion of individual cultures into a demotic polyglotism ominous with unresolved hostilities.”4 While it might be tempting to dismiss this as the fever dream of the bad old days, before hipster gentrification, smart growth, and downtown redevelopment, Southland Tales (2006), In Time (2011), and Elysium (2013) have done little to alter its imagery. Northern California-as-utopia, on the other hand, is strongly linked to the countercultural movement of the sixties, with its guides for technologically advanced back-to-the-land living. One can read Ernest Callenbach’s influential novel Ecotopia (1975) as the possible future seeded by Whole Earth Catalog. Ecotopia is a fictional “field study” of a future Pacific Northwest society that has split from an apocalyptic United States and is governed according to ecological principles. While much technology has been abandoned, the Ecotopians have selectively retained public transit, electric cars, networked computers, and improved recycling (Callenbach was a longtime resident of Berkeley). Ecotopia‘s themes were later picked up and elaborated in the eco-feminist tales of Ursula K. Le Guin’s Always Coming Home (1985), a cultural anthropology of latter-day Napa Valley-ites who have returned to indigenous ways; Starhawk’s The Fifth Sacred Thing (1993) about a pagan, nonviolent San Francisco threatened by southern biological warfare; and Octavia Butler’s Parable books (1993, 1998) where refugees from the LA wasteland grow a new eco-religion, Earthseed, in the forests of Mendocino. A third, smaller, but consistent vein of sci-fi unites both utopian and dystopian futures without mapping them onto a Nor Cal–So Cal binary, and dispenses with the quasi-biblical tales of Sodom and Eden. More importantly, it allows the possibility of multiple futures for rethinking the present. A number of films depict the north as a dystopia-within-utopia: Gattaca (1997) set in a near future where genetic modification is cheaply available, and earlier films such as THX 1138 (1971) and Colossus: The Forbin Project (1970), in which developments that promised well-being and peace surveil and threaten human civilization, speak to an unease with the promise of information technology. Similarly, the rebooted Planet of the Apes films have replaced fortress LA with the sleek research complexes of Silicon Valley. In William Gibson’s Bridge Trilogy, San Francisco suffers the noir-ish malaise of Blade Runner LA; this time due to free-agent capitalism run amok, with a community of squatters inhabiting the rusting hulk of the Bay Bridge, and bike messengers, data pattern analysts, and a rogue pop idol with artificial intelligence in the lead roles. In the south, Kim Stanely Robinson’s Three Californias trilogy (1984–1990) posits three possible directions for Orange County: The Wild Shore follows nuclear apocalypse, The Gold Coast extrapolates a 2027 “autopia” from 1980s suburbia and hyperconsumption, and Pacific Edge allows that even the OC might have access to a sustainable future, as communities reclaim the coast from cars and concrete. The sci-fi imagination has a strong link (one might even call it a feedback loop) to the tech and entertainment industries that drive California’s economy, and therefore, its very real, near-term growth. Sci-fi narratives are, after all, allegories for the times in which they are created, but they also generate a nostalgia for past images of the future, which shape communities’ actions as they build and plan—and as those communities experience their lived environments. Some critics have made much of the fact that Ridley Scott originally planned to film Blade Runner in New York and the studio requested a location change. But this is largely irrelevant, as the movie’s imagery and subject matter have resonated with audiences, and played a huge role in how LA is viewed and how the city has imagined itself over the past few decades. On the day I visited to photograph the atrium of the Bradbury Building, the only other people present were fans of the movie looking for traces of that elegantly distressed future. Repetition of the tropes of urban decay versus ecotopia might become self-reinforcing in a way that precludes thinking differently about the present, or even seeing that the future that we’ve come to expect might not be the one we’re likely to get. Fredric Jameson argues that the value of utopian/dystopian sci-fi is not that it delivers images of possible futures, but instead is its ability to “defamiliarize and restructure our own present.”8 The photographs in the slideshow above show how filmmakers have taken familiar California locations from downtown Los Angeles to Berkeley to do just that. Download the embed code to share Kristin Miller’s slideshow on your website. Image at top: San Francisco in 2259 in Star Trek: Into Darkness, Paramount Pictures, 2013. 1 Miriam Greenberg, Branding New York: How a City in Crisis was Sold to the World (New York: Routledge, 2008), 157. 2 Mike Davis, Ecology of Fear (New York: Picador, 1999), 359. 3 Mike Davis, City of Quartz (New York: Verso, 2006), 230. 4 As quoted in Ecology of Fear, 359. 5 Ted Trautman, “Why Star Trek Made San Francisco the Center of Its Futuristic Utopia,” Wired, 21 May 2013. Accessed online: http://www.wired.com/underwire/2013/05/star-trek-san-francisco/? cid=8173514. 6 Carl Abbott, “Falling into History: The Imagined Wests of Kim Stanley Robinson,” Western Historical Quarterly 34 (Spring 2003): 29. 7 Richard Kelly, Southland Tales, 2006. 8 Frederick Jameson, Archaeologies of the Future (New York: Verso, 2005), 286.